Netwoven Blog Dynamics 365 Portal: What’s Awaiting in the Latest April Release? As promised, Microsoft has been providing regular updates to Dynamics 365. If you have already been using great new features from October 2018 release, and are looking forward to new features in next release – April 19, we have a piece of great news for you. Microsoft has published and shared their April 19 Release Notes. 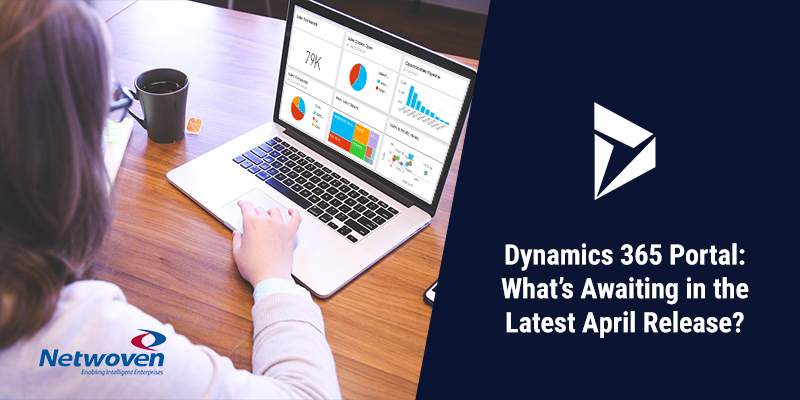 Today, we are going to talk about the features related to Dynamics Portal. Every company has some downtime for their internal environments during various scheduled maintenance windows. Or there are times you want to take the site down while applying some major updates to the portal application. Microsoft is finally adding a new feature, which will allow administrators to display the message “Website Under Maintenance” during routine website upkeeps. This mode will allow us to avoid showing irregular service unavailability errors or cryptic errors messages to end users that can impact user satisfaction and search rankings of portal. We run into many scenarios where we want to show external data in the portal. External data could be from the backend system, other LOB applications, SQL databases or 3rd party applications. Some of the advanced users have developed solutions around this limitation by using retrieve plugins but it involves lot of complicated steps. In the latest release of April 19, we will have a simpler solution by making client-side calls to external APIs and secure them by using OAuth Implicit Grant Type flow. Over the years, integrating power BI dashboard in Dynamics Portal had been a complex task and required writing custom logic to handle and manage security token. A feature to showcase Power BI dashboards in Dynamics Portal was added at the end of 2018. It is done by using liquid tag. One limitation was that the end user still required a Power BI license to see the Power BI tile in Dynamics Portal. Good news is, in April 19 Release, Microsoft is adding a support for Power BI embedded. If you have not heard of Power BI embedded term, the key is it doesn’t require portal end users (your customers/partners) to have a Power BI license. This means you can publish a Power BI dashboard in your Dynamics Portal to thousands of customers. Keep in mind, you need a Power BI embedded (pay-as-you-go) subscriptions) or a Power BI premium (monthly) subscription to enjoy this agility. This is my favorite feature from the coming release. It is based on a very common use case where we have built a CDS based power apps solution and now want to showcase some of the highlighted features to external users/customers in a web portal. As of today, this can only be achieved if you have the data integrated to Dynamics 365 Customer Engagement/CRM Instance. Another use case, which we have seen for many of our clients, is the ability to build portal on Dynamics 365 F&O instance (or other ERP system). With CDS for apps Integration, which allows seamless and out of the box integration solution for syncing Dynamics 365 F&O/AX data to CDS, CDS Starter Portal will allow us to build a web portal with point and click configuration on top of your Dynamics 365 F&O Data. The new release is much-awaited and it is surely going to perk up the usability of Dynamics Portal. As for now, this bird-eye view of latest features coming up in the month of April is enough to refresh your idea box! Do share your thoughts on how these features can streamline your development processes. Till then happy reading!